Deb's Cup of Tea: Day 13 and this wasn't what I was going to do. The weekend was to be a time of productivity. I spent Saturday cleaning the piles off the table in the living room, dealing with all the papers and things I had just dropped there. 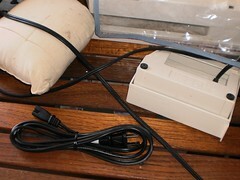 I found a place that sells power cords for my sewing machine. I got one and, thankfully, it's the cheaper of the two available. I just needed to clean off the table so I could set everything up and get sewing. You know how it is with these kinds of projects. Setting this up meant I had to clear off the ironing board, which mean I needed to clean the litter boxes and make a path to the ironing board. I really need a new ironing board cover, too, but that will have to wait. A towel over the top works just fine. she was having none of it. I attempted to pick her up and she extended her claws which I knew would tear the tissue. Okay, let's find something else to do until she decides she doesn't want to sit on things anymore. I know, I'll work on the cross-stitch. The minute I sat down, Pilchard was in my lap. She was just exceptionally clingy yesterday. Oh well, there are worse things than to have a cat want your lap. Instead of sewing on the jacket, I worked on the cross-stitch. Two more leaves were finished and I had a happy cat. I thought I was done with this side but I'm not. 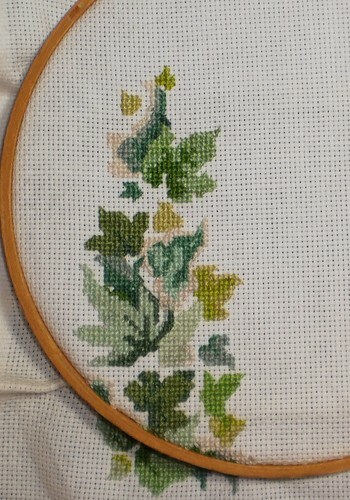 There is one more leaf to do at the top. It's coming along nicely even it I have to stop and provide ear scratches.